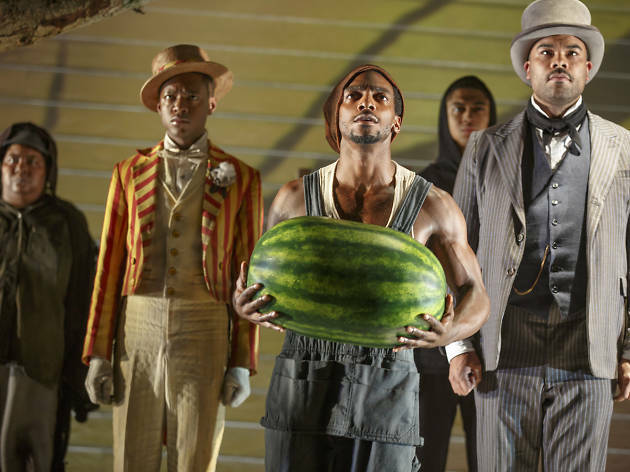 Surreal doesn’t begin to describe watching Suzan-Lori Parks’s postmodern vaudeville of African-American stereotypes the day after Trump was elected. A jazzy, poetic fever dream about the wounds left by erasure on the book of history, this 1990 piece seems especially shocking when you consider the grotesque chapter our country’s chroniclers are about to inscribe. “Yesterday today next summer tomorrow just uh moment uhgoh in 1317 dieded thuh last black man in thuh whole entire world,” says Black Woman with Fried Drumstick (Roslyn Ruff), a line that neatly encapsulates Parks’s textual strategies: warping temporality and dialect to create music and noise. 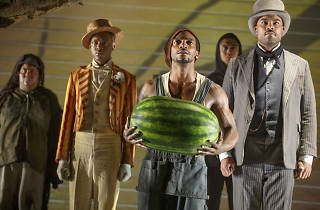 The focal characters are Black Woman and Black Man with a Watermelon (Daniel J. Watts), a couple surrounded by a nine-member chorus that includes the besuited white-speaking Voice on Thuh Tee V (William DeMeritt), the seductive Egyptian Queen-Then-Pharaoh Hatshepsut (Amelia Workman) and hoodie-wearing youth And Bigger and Bigger and Bigger (Reynaldo Piniella). All of these cryptic, allegorical figures comment on the nonlinear story line, eventually welcoming the lynched Black Man into their ranks as part of an abject ritual of continuity. Clearly, this is not an easy play to dissect or digest, with diverse influences that suggest Gertrude Stein, Adrienne Kennedy, Samuel Beckett and Glenn Ligon. It’s a jagged, angry, weird text, yet director Lileana Blain-Cruz stages it in high style, with a skin-prickling soundscape by Palmer Hefferan (including dance-break music that’s aggressively fun) and a raft of brave in-your-face performances. These days, many may look to theater for an escape. Juxtaposing hambone humor and existential horror, Parks points the way to the hole. Want to climb inside? Pershing Square Signature Center (Off Broadway). By Suzan-Lori Parks. Directed by Lileana Blain-Cruz. With ensemble cast. Running time: 1hr 15mins. No intermission. Through Dec 18. Click here for full ticket and venue information.